Sometimes the simplest recipes are best. 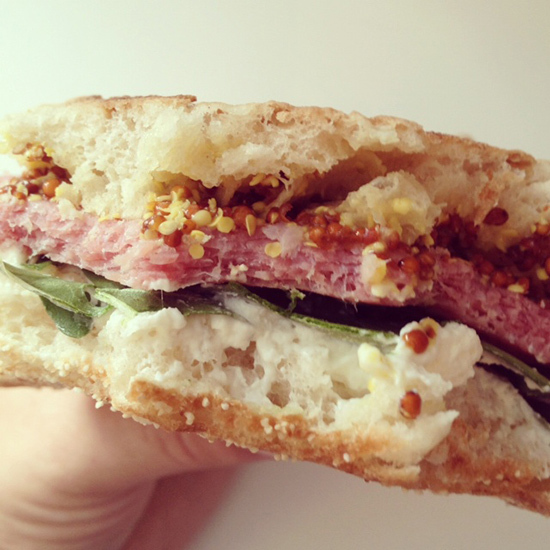 This Martha Stewart Salami Cream Cheese Sandwich is a creative take on salami that elevates the brown bag classic from my childhood days. 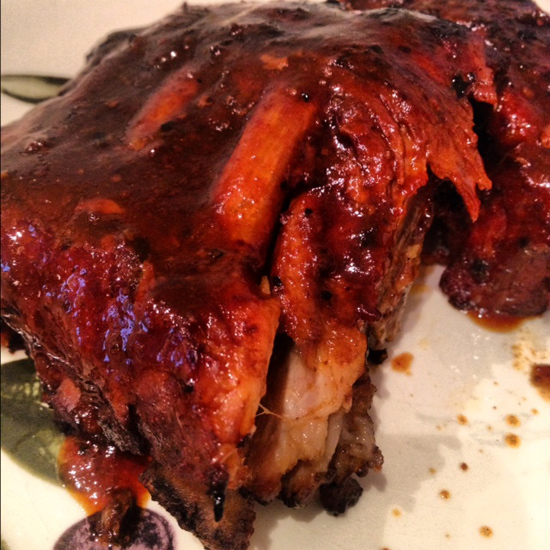 How good can it be when BBQ ribs meet the slow cooker? Well Van, who’s usually sort of vegetarian (not through any effort on my part) yelled “meat!! !” for the first time. These were actually more tender than many I’ve had at restaurants. We used Stubb’s sauce. This pork ssam may very well be the best meal I’ve ever made. Easy too, you just need to set aside 12 hours (only 6 of which you even need to be awake for). Chang might be a culinary great but I prefer myself as chef. I won’t get all dicky about taking photos of the food and the cost was a fraction of what I’d spend in the restaurant. Thanks to Mike for the special sauce ingredients and buns. I am always intimidated to make a restaurant favorite, especially one as seemingly complex and delicate as Bahn Mi. 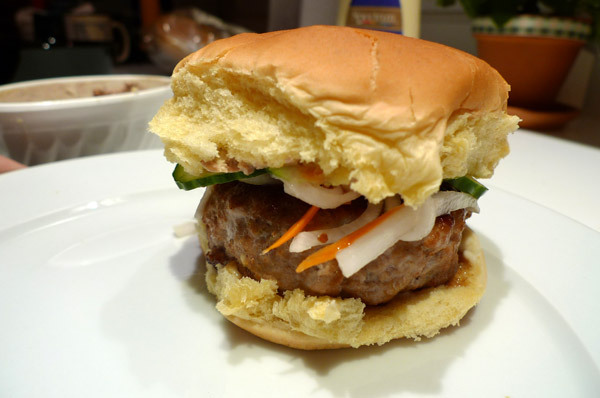 But.. if the recipe changes things up a bit like this Vietnamese Bistro Burger, I am more up to the challenge. These are so good, Mike said I could win some sort of Food Network challenge with them.. except that I got the recipe from Food Network Ultimate Recipe Showdown. 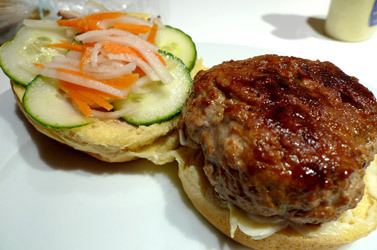 One more time that Asian flavor, ground pork and I get along swimmingly. 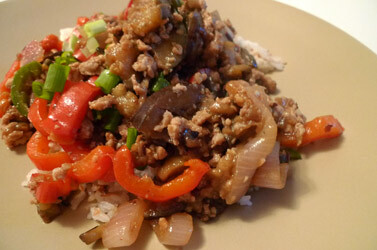 Another ground pork asian dish with a kick and another winner. This time, Emeril’s Spicy Pork Stir-Fry with Coconut Scallion Rice adds toothsome eggplant. The inclusion of ground pork versus slices is my input. I just bought ready made coconut rice from Fresh Direct for ease. For some reason, I have never made rice well from scratch – it ends up either hard in the middle or mushy. While I don’t like the use of the word “gravy” in this context – to me gravy is opaque and thick and brown – I’ll forgive Emeril his choice of words, because this Shrimp, Chorizo and Chipotle Gravy is great. 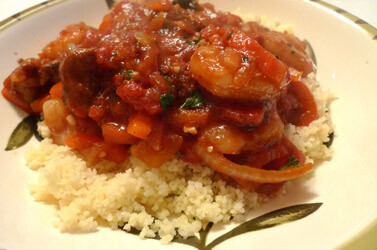 Spicy and filling, it’s meant to go over Mexican rice, but I opted for what I had available, couscous. 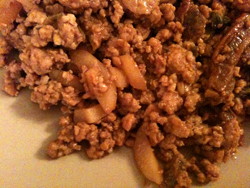 I’m telling you: ground pork plus an Asian recipe equals me me making kitchen magic. 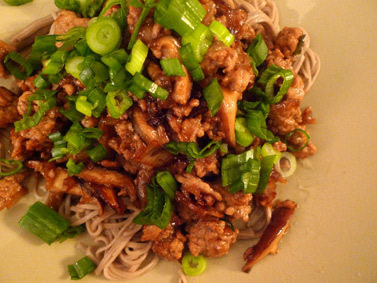 This particular concoction of Minced Pork with Soba Noodles comes from the great Serious Eats (which found it on Appetite for China) and boasts a list of very simple ingredients that result in a very complex and spectacular dish. Our friend Mike is nothing if not ambitious: if you’ve taken a look at David Chang’s recent Momofuku Cookbook, you know that these are not simple fixins. Mike decided to have friends over the other night to try a selection of FOUR. Most impressively, all were delicious and made in a tiny kitchen sans staff of many to help. The noodles are nice and simply refreshing. 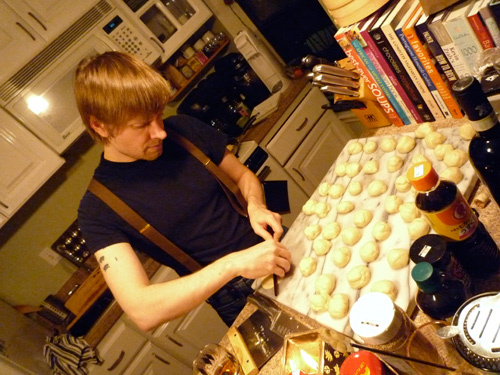 The rice cakes, which he improvised the most, were spectacular in their bold flavor. The cauliflower was a wonderful starter with a tangy vinaigrette, and the pork buns were simply incredible. Plus, he had no snobby issues with the people eating his food taking photographs. Want to make a room of dudes freak out? 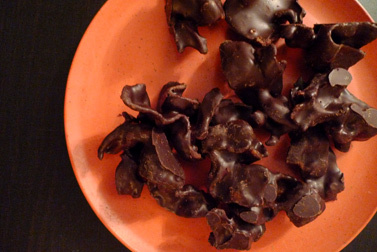 Put a plate of dark chocolate covered bacon in front of them. Needless to say this treat, which is exactly what it sounds like, was a hit for Dungeons and Dragons snacking. 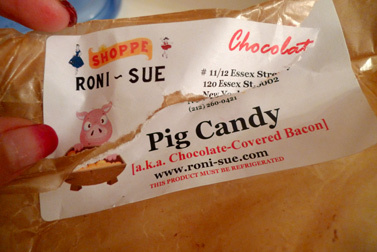 Of course, I’ve combined Bacon and dessert before (with the amazing Mo’s Bar and that glorious treat that is candy bacon) but Roni-Sue, whose shop I visited at the Essex Market, takes the simplest and most intense approach. “Roni” a lovely lady named Rhonda Kave who calls it Pig Candy. 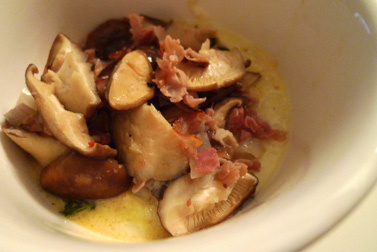 With my very limited patience as a cook and a human being it’s impressive that I spent nearly two hours preparing this Grits, Ham and Mushroom dish the other night, and thank goodness it was all well worth it or I’d never spend that long ever again. I could seriously have served this in my own little country farm, Egg-style restaurant and make a killing, even nabbing a spot on all the Time Out and New York best of lists… but I digress. The only trouble I encountered was that my grits stayed liquidy rather than congealing into a cake like the recipe intends (though it didn’t affect the magnificent taste one bit). I would probably follow the box directions for the grits part rather than the ones listed in the recipe for more predictable results. 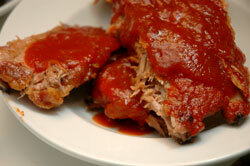 The sauce, by the way, is incredible and must be able to be utilized in other recipes. And don’t skimp on the ham, go for the best you can find. Mario Batali doesn’t mess around when it comes to his Ragu Bolognese. Veal, pork, and pancetta? No wonder this hearty meal filled us up so thoroughly. Mike, who was nice enough to prepare this dish for us, substituted parsnips for carrots. 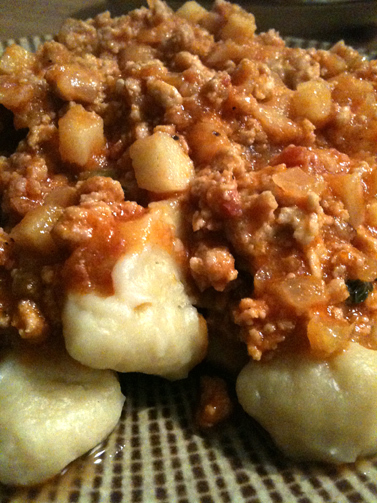 The recipe comes from the Molto Italiano cookbook. I loved my dinner tonight! 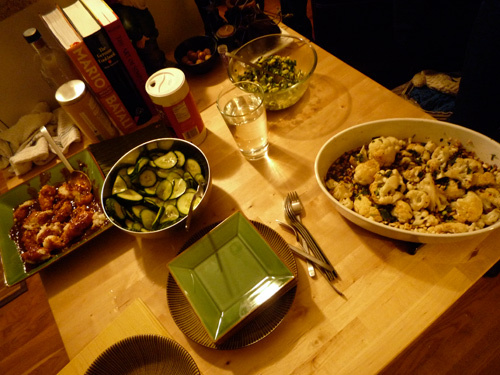 And not just because Jim cooked while I didn't lift a finger – it was also truly delicious. Sure, a recipe called Fish Flavored Pork might turn some folks off, but they'd be missing out on a complex, spicy dish that would go well with some steamed rice and a beer. We subbed porcini for tree ears and ground pork for strips. I found it on Use Real Butter, a lovely food blog with more recipes that I'm curious to try. Gumbo is the kind of meal I simply don't have the patience to make myself. Fortunately my friend Mike possesses such virtues and is kind enough to share the fruits of his labours. 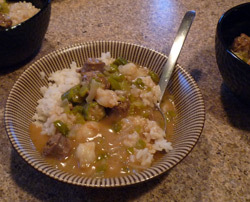 His recipe calls for lots of okra, sausage and shrimp over a heap of white rice. It's spicy, rich and delicious. Here are some basic recipes to work off of. Why do I mention it now? Because the weather and season is finally begging for barbeque goodness. There are a few things I usually won't even bother to try and make on my own, ribs are one of them. Most recipes usually require a BBQ, which is not feasible in my apartment, but these babies are baked and despite a long prep time (a whole day of marinating and two hours cook time), a fairly simple ordeal. The results betray this fact: this is a delicious, restaurant caliber dish that I could not believe I had made myself. Share with friends, though, there will be plenty. Porchetta has been at the top of my list since it topped all the big end of the year restaurant round ups, but the place is super tiny and with little chance of grabbing a seat and the weather being as crummy as it has been, we've yet to make the visit until just this week. 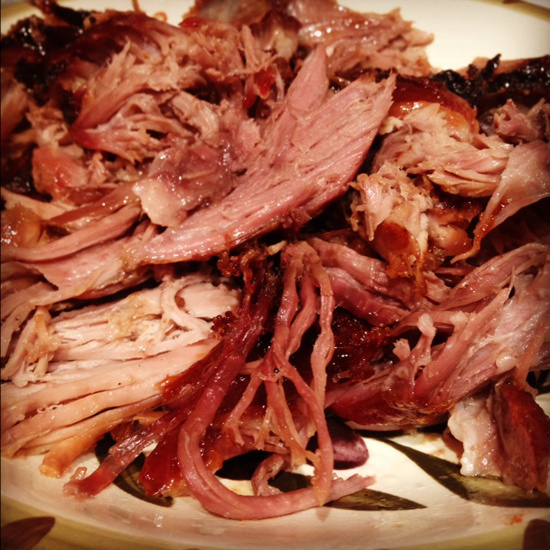 The titular and most popular dish is, of course, porchetta, an Italian culinary tradition of roasted pork with crispy skin, lots of herbs and spices then slow cooked. There are sides too, but we just stuck to the?main attraction. It's out of this world yummy. Don't bother to spoil the layered textures and moist juices with any extraneous toppings – this is one sandwich meant to stand on its own sans condiments. The sandwich is smaller than I expected, which is probably a good thing as far as my calorie intake?goes, and it was plenty filling. 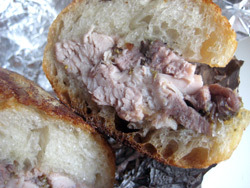 It's served on a ciabatta roll that holds up to the intense innards without overpowering it (I hate to bite into and sandwich and get all bread) but you can also order the pork as a platter without bread, but I can imagine it's quite difficult to take away. The place is crowded but the line moves pretty fast; it's bound to become a classic East Village destination and I can't imagine that between the overwhelmingly positive word of mouth and the amazing food that it will be going away anytime soon. Still, I'd stop by sooner than later – heavy cracklins and pork sandwiches tend to suit the slightly cooler days of early Spring more than the dead of Summer.